How does an isolated developing economy survive, and even thrive, in its transition to open markets and globalisation? Economists have long been interested in the dynamics of comparative advantage and economic growth, but only recently have they begun to use detailed product-level data in their analysis (Hidalgo et al. 2007, Cadot et. al. 2011, Daruich et al. 2016). There is also little basis for long-run comparisons between today’s least-developed and advanced countries. 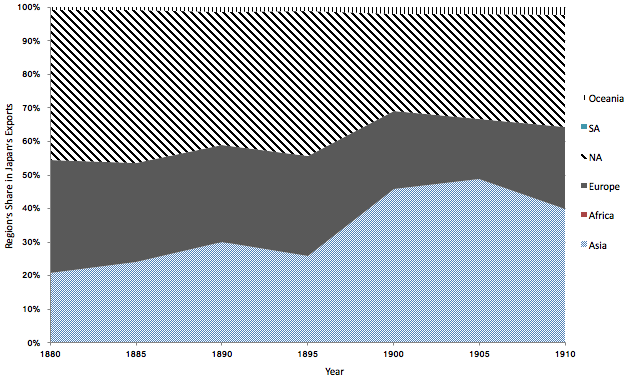 Not much is known about whether and how nations increased their number of trade partners and the number of actively exported products during the first wave of globalisation at the turn of the 20th century because detailed product level datasets are only now becoming available for systematic analysis. In prior research – based largely on the historical experience of Great Britain, a wealthy industrial country that specialised early on in manufactures, exchanging these for raw materials – the integration of world markets preceding WWI has been characterised as the 'Great Specialisation' (Findlay and O’Rourke 2007) or the 'First Great Unbundling' (Baldwin 2016). 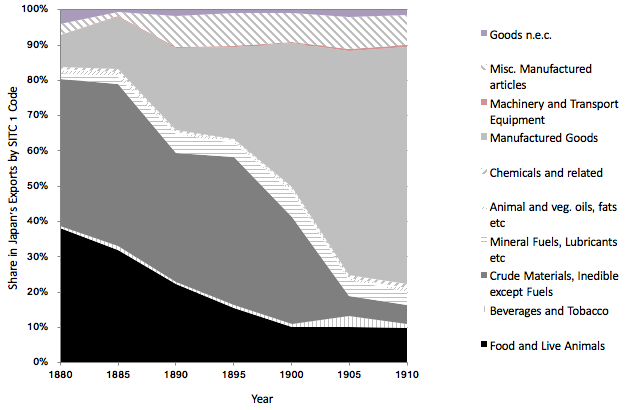 Our research augments this view by showing how an emerging economy – namely, Japan in the late 19th century – was able to take advantage of the various margins of trade to become an internationally competitive exporter, breaking into new markets and selling an increasingly wide range of new products (Meissner and Tang 2017). These results, in turn, may help identify long-run patterns as well as possible challenges for other would-be participants in a globalised economy. In the period we study, 1880 to 1910, there is little doubt that trade costs for Japanese exporters fell dramatically due not only to new technologies but also to concerted investments in, inter alia, improved market intelligence and the expansion of formal and informal empire. Industry-specific sales agents, firm-based marketing strategies, as well as the establishment of diplomatic ties helped inform producers about market opportunities abroad. At the same time as these forces intensified, Japan experienced rapid structural change, imported foreign technologies, built a national railway system, and increased productivity in the late Meiji period (Perkins and Tang 2017, Tang 2014). We are interested in finding out how the ‘margins of trade’ (i.e. the composition of products and destinations) evolved in this period in response to these changes. Could changing comparative advantage explain which nations Japan traded with and which products it exported? Ostensibly, Japan’s comparative advantage after the liberalisation of the 1850s was largely based on specific know-how in specialised ‘old’ products (e.g. silk and tea) and its relative abundance of labour. In the decades spanning the turn of the 20th century, Japan’s human capital endowment strengthened significantly and investment in machinery and equipment also increased. These forces suggest that Japan could transform itself from an exporter of raw materials and traditional goods to higher valued-added ‘new’ manufactured goods. Indeed, in the decades after Japan’s opening, the nation did not simply stagnate and insert itself neatly into the international division of labour by simply exporting more of the same old unfinished products to the advanced nations based on an its historical factor endowments. Figures 1a and 1b show that Japan’s manufacturing exports were a small fraction of foreign sales in 1880, but they dominated by 1910. Moreover, Japan’s exports to neighbouring countries in Asia rose more quickly than exports to the advanced nations of Europe. Our results indicate that static comparative advantage is insufficient to explain these changing patterns in Japanese exports, but we also find mixed evidence various tests of an alternative – the Linder hypothesis – which would suggest increasing trade intensity with leading nations. We find instead that trade costs, destination market demand conditions, and product specific factors play significant roles in explaining Japanese exports of new goods to new markets in the 19th century. To study these issues, we hand-collected, digitised, and cleaned official Japanese export data between 1880 to 1910 every five years at the product-partner level. With these new data we can, for the first time, systematically explore these issues at a high level of disaggregation. Our data allow us to track trade in products at the three-digit level for a large number of destinations. We supplement these new data with traditional determinants of bilateral trade that proxy for trade costs such as port-to-port shipping distances, diplomatic representation, shared monetary regimes, and colonial status of the destination. We are particularly interested in tracking the diversification of the export-product space and diversification of destinations. Additionally, we explore the determinants of market entry at the country-product level. 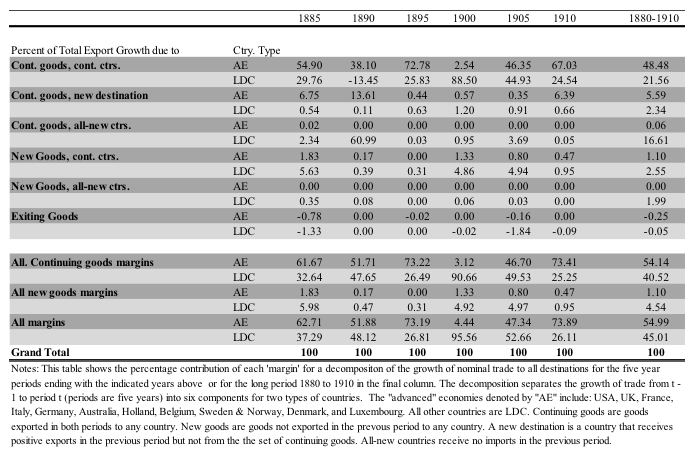 Our decomposition of the growth in trade, as shown in Table 1, indicates that roughly 30% of growth in exports between 1880 and 1910 came from shipping new goods to new countries, selling new goods to extant trade partners, and introducing already active products to new countries (i.e. growth in the extensive margins). In other words, Japan did not simply extend the sales of existing product lines with its historical trade partners. At the three-digit level of aggregation, we find that Japan increased the number of products exported over the period from 67 products in 1880 to 116 in 1910. The number of destinations rose from 17 to 31. A number of decompositions of trade growth by country and over different benchmark years break these extensive margin changes down into several sub-sets such as selling active product lines to new countries, selling new product lines to active trade partners, and selling new goods to new trade partners. Moreover, we are able to decompose the growth of trade by level of economic development showing that growth in new goods to least-developed countries explains more of the expansion of trade than growth of new goods to advanced economies. We also study the dynamics of market ‘entry’ at the product level. Japanese goods had very high probabilities of expanding the number of destinations after entry into at least one market. The probability of decreasing the number of markets after first entry never exceeds 20%. Results from our logit regressions for the probability of first market entry indicate that market size and traditional trade cost proxies are strong determinants. As far as entry into other markets after a product’s initial launch is concerned, market demand characteristics, success of other Japanese products in that market, product success on other world markets, as well as product/demand interactions are as important as traditional trade costs. Our research is among the first to systematically study these issues for any country in the first wave of globalisation (cf. Huberman et al. 2015), but more work along these lines is imminent due to the collection of similar data sets. Intriguingly, our findings are closely related to those of Evenett and Venables (2002), who decompose the growth of exports into product growth and new country growth between 1970 and 1997 in the context of a very different global environment. In conclusion, we find that Japan concentrated on and invested in decreasing trade costs and improving its capacity to market particular goods abroad. The case of Japan also presents some puzzles as modern trade models would suggest a rapidly growing economy like Japan’s would increasingly tend to export more and higher quality goods to relatively richer trade partners (Linder) or else persist in exporting raw materials and traditional goods (Ricardian or factor endowment models). There is little evidence of either in the period we study. Our results indicate that distance and size, as well as institutional groundwork, remained important to Japanese export prowess, aided by infusions of foreign technology, domestic infrastructure investment, and a generally stable macroeconomic environment. Baldwin, R (2016), The Great Convergence: Information Technology and the New Globalization. Cambridge: Harvard University Press. Cadot, O, C Carrère and V Strauss-Kahn (2011), “Export Diversiﬁcation: What’s behind the Hump?” Review of Economics and Statistics 93(2): 590-605. Daruich, D, W Easterly and A Reshef (2016), “The Surprising Instability of Export Specializations” NBER Working Paper No. 22869. Evenett, S and A Venables (2002), "Export Growth by Development Economies: Market Entry and Bilateral Trade." Unpublished manuscript. Findlay, R and K O'Rourke (2007), Power and Plenty: Trade, War, and the World Economy in the Second Millennium. Princeton: Princeton University Press. Hidalgo, C A, B Klinger, A L Barabási and R Hausmann (2007), “The product space conditions the development of nations.” Science, 317(5837): 482-487. Huberman, M, C M Meissner and K Oosterlinck (2015), “Globalisation everywhere, except in the growth numbers: Pessimism reaffirmed?”, VoxEU.org, 6 February. Meissner, C M and J P Tang (2017), "Upstart industrialization and exports, Japan 1880-1910." NBER Working Paper No. 23481. Perkins, D and J P Tang (2017), "East Asian Industrial Pioneers: Japan, Korea, and Taiwan", in K O'Rourke and J Williamson (eds), The Spread of Modern Industry to the Periphery since 1871, Oxford: Oxford University Press. Tang, J P (2014), "Railroad Expansion and Industrial Development: Evidence from Meiji Japan." Journal of Economic History, 74(3): 863-886.